Broadlands, located in sought-after Ashburn, Virginia, is a beautiful master planned community situated on over 1,500 gorgeous acres. Developed with the environment in mind, Broadlands has been named a Certified Wildlife Habitat Community by The National Wildlife Federation. The focus on nature is highlighted by Stream Valley Park, a natural refuge that includes wetlands, wildlife preserves, and lush woods and trails. A nod to nature is also prevalent within the HOA building which is home to a quaint Nature Center where residents can visit with a bunny or watch as turtles explore their magnificent home. In addition to avant garde aesthetics, Broadlands developer, Van Metre, also incorporated everyday conveniences that make life a little easier. There is plenty of shopping with the Broadlands Marketplace which includes the Harris Teeter grocery store as well as Glory Days restaurant and Bank of America, just to name a few. As if the Marketplace didn’t give you enough variety, you also have the luxury of shopping at the Broadlands Village Center which boasts a Safeway grocery store, Bonefish restaurant, Anytime Fitness, and many other speciality shops. Other amenities for Broadlands include 3 community pools, two tennis courts, the Nature Center, tot lots, and walking trails. The HOA also sponsors awesome events making a development a community! Events include: Nature programs for adults and children, a Visit with Santa, Egg Hunt with a Visit from the Easter Bunny, a Halloween Parade, Teen Pool Party, Broadlands Live Concert Series, Flicks in the Sticks Outdoor Movies, and much more! All of this is included in your HOA dues which range from $68.00 per month up to $155 per month depending if you include Broadband. The HOA is professionally managed by Armstrong Management. Worried about your commute? No need! The Broadlands is perfectly placed just minutes from the Dulles Greenway and close to Route 28, making the Broadlands the ideal place to call home! Ready for a taste of what the Broadlands has to offer? Let us give you a tour! Currently, Ask Gina & Company has a FANTASTIC listing in the Broadlands located at 21902 Schenley Terrace. 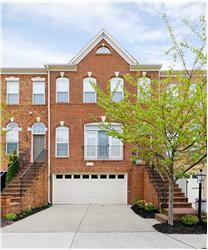 This luxurious, brick front, 2 car garage townhome has everything on your list: formal living room with tray ceiling, formal dining room with gleaming hardwood floors, gourmet kitchen with upgraded cabinets, stainless steel appliances, and a center island! In addition the family room with gas fireplace is open to the kitchen giving you the open floorplan you have been looking for! Retreat for the night to your huge master bedroom with attached master bath with beautiful corner soaking tub. Two other spacious bedrooms and another full bath round out the upstairs. Still need more space? This home accommodates! Relax in your finished lower level rec room with half bath…All of this and a designer touch! Here is a sneak peak: Broadlands Home. Want to tour this home or other Broadlands home opportunities? Contact the Loudoun County Real Estate experts at Ask Gina & Company today and let us unlock the possibilities!